Arkham House, 1948; 235 pp. ; limited to 2000 copies. First Edition. 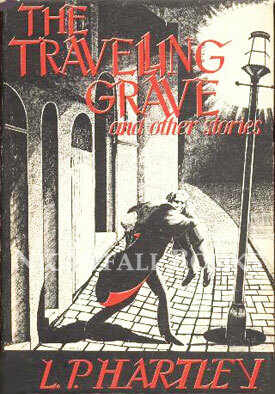 The Travelling Grave and Other Stories is a collection of fantasy and horror short stories by author L. P. Hartley. It was the author's first American collection of fantastic tales. Book is solid and clean; black binding cloth is clean, bright, and unblemished; all corners are sharp; top and bottom of spone are bumped; minor wear along bottom edge of boards; gilt lettering on spine is bright; small very shallow dent in middle of back cover; pages are clean and bright. Dust jacket front is clean, bright, and unblemished; minor chipping and creasing at top of spine; minor wear at bottom of front fold; flaps are clean and bright with original price ($3.00) unclipped; age yellowing along top edge and along folds; rear cover is clean. Overall, this is a near fine copy of the book in a near fine dust jacket. "A Visitor from Down Under"
"Three, or Four, for Dinner"